This 40GBase-LR4 QSFP+ module delivers what you need most in your network connections: reliable performance. Itâ€™s built to exacting MSA specifications and fully tested to ensure seamless compatibility. The single-mode QSFP+ transceiver module offers a cost-effective way to add, replace or upgrade the ports on your networking equipment, and itâ€™s backed by a lifetime warranty. 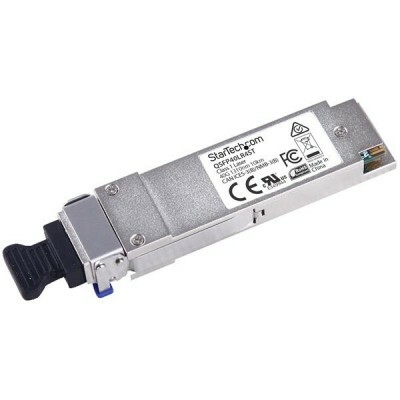 With data transfer rates of up to 40Gbps and support for Digital Diagnostics Monitoring (DDM / DOM), this QSFP+ module can be installed into fiber networking equipment with an MSA compliant port, using an LC connector. It delivers dependable 40 Gigabit connectivity over single-mode fiber for 40GBase-LR4 compliant networks, with a maximum distance of up to 10 km (6.2 mi.) and 1270 nm to 1330 nm optical wavelength. You can count on QSFP40LR4ST for reliable performance, backed by a lifetime warranty and free lifetime technical support.